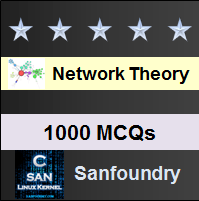 This set of Network Theory Multiple Choice Questions & Answers (MCQs) focuses on “Hurwitz Polynomials”. 1. The denominator polynomial in a transfer function may not have any missing terms between the highest and the lowest degree, unless? Explanation: All the quotients in the polynomial P(s) are positive. The denominator polynomial in a transfer function may not have any missing terms between the highest and the lowest degree, unless all even or odd terms are missing.For example P(s) = s3+3s is Hurwitz because all quotient terms are positive and all even terms are missing. Explanation: The roots of the odd and even parts of a Hurwitz polynomial P (s) lie on jω axis not on right half of s plane or on left half of s-plane. Explanation: If the polynomial P (s) is either even or odd, then the roots of P (s) lie on jω axis not on right half of s plane or on left half of s-plane. 4. If the ratio of the polynomial P (s) and its derivative gives a continued fraction expansion with ________ coefficients, then the polynomial P (s) is Hurwitz. Explanation: If the ratio of the polynomial P (s) and its derivative P‘(s) gives a continued fraction expansion with all positive coefficients, then the polynomial P (s) is Hurwitz. If all the quotients in the continued fraction expansion are positive, the polynomial P(s) is positive. 5. Consider the polynomial P(s)=s4+3s2+2. The given polynomial P (s) is Hurwitz. After doing the continued fraction expansion, we get all the quotients as positive. So, the polynomial P (s) is Hurwitz. 6. When s is real, the driving point impedance function is _________ function and the driving point admittance function is _________ function. Explanation: When s is real, the driving point impedance function is real function and the driving point admittance function is real function because the quotients of the polynomials P(s) and Q(s) are real. When Z(s) is determined from the impedances of the individual branches, the quotients are obtained by adding together, multiplying or dividing the branch parameters which are real. 7. The poles and zeros of driving point impedance function and driving point admittance function lie on? Explanation: The poles and zeros of driving point impedance function and driving point admittance function lie on left half of s-plane or on imaginary axis of the s-plane.. Explanation: For real roots of sk, all the quotients of s in s2+ωk2 of the polynomial P (s) are non-negative. So by multiplying all factors in P(s) we find that all quotients are positive. 9. The real parts of the driving point function Z (s) and Y (s) are? Explanation: The real parts of the driving point impedance function Z (s) and driving point admittance function Y (s) are positive or zero. Explanation: P(s) and Q(s) are real when s is real. So the poles of the network function are real and zeros of the network function are real, the complex zeros to appear in conjugate pairs.